Sasuke contemplates taking on Boruto as a disciple. He challenges Boruto to perform the Rasengan. Confident, Boruto see’s no challenge in this. Sasuke flashes back to a conflict he has with 2 Otsutsuki clan members. The following morning Boruto awakens Konohamaru, he ask’s him to teach him the Rasengan. He agree’s to teach him. Boruto instantly takes a dislike to the training, but he does learn the Rasengan. The size of his Rasengan is disproportionately small compared to normal. This infuriates him and he throws the Rasengan and leaves. Sarada tells her father that he’s being too strict. He tells her he intends on training Boruto. Boruto runs into Katasuke, and tells him the situation he’s having. Katasuke offers him the Kote as a solution. Boruto uses the Kote to generate a normal Rasengan. 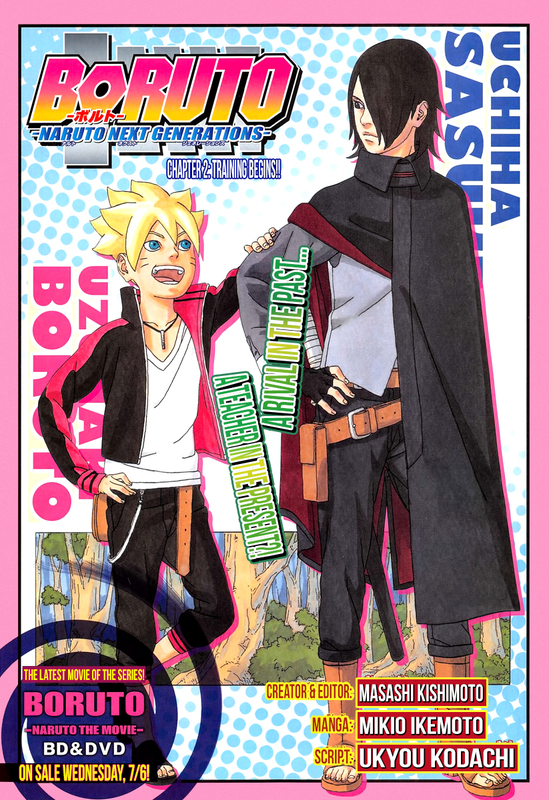 Sasuke isn’t fooled, but doesn’t let Boruto know it. Over a bond fire Boruto asks Sasuke what Naruto’s “weakness” was. Sasuke tells him that Naruto is “full of weaknesses,” but he managed to overcome them. 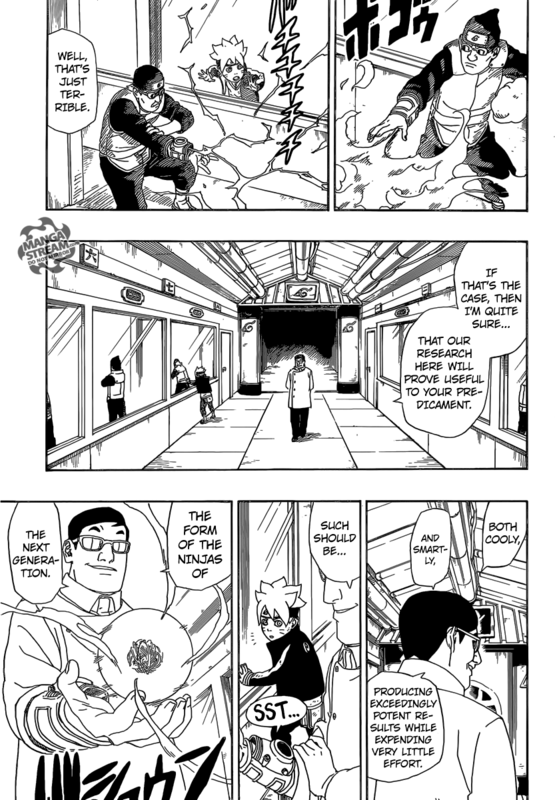 Sarada, Mitsuki and Boruto meet and discuss their intention to participate in the chuunin exam. Meanwhile, Kinshiki and Momoshiki defeat Killer B and absorb his chakra. 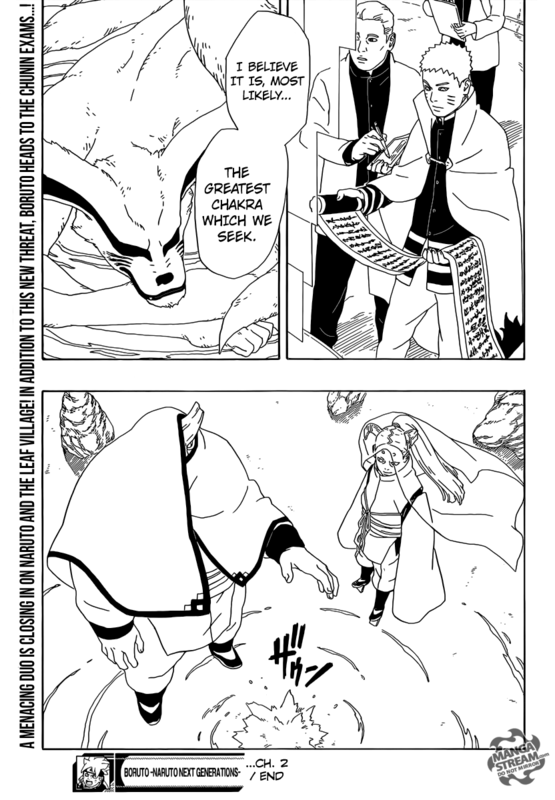 They detect Kurama within Naruto and decided to attack him next. This series so far is just a retelling of the Boruto movie. If you saw the movies this series so far is probably a disappointment. At this rate we won’t get new content until 5 or 6 chapters. That means months, considering the fact that this series is released on a monthly basis. In addition to that the art is still not good enough for me. I will continue with the series however, I have high hopes for the series. Orhime notices Ichigo’s new form. She remembers his form from his fight with Ulquiorra. She calls to him and he responds with a smile. He reassures her that he’s still the same. Yhwach notices that Ichigo has combined the power’s of a Quincy and Hollow. However, he must maintain balance or lose control. 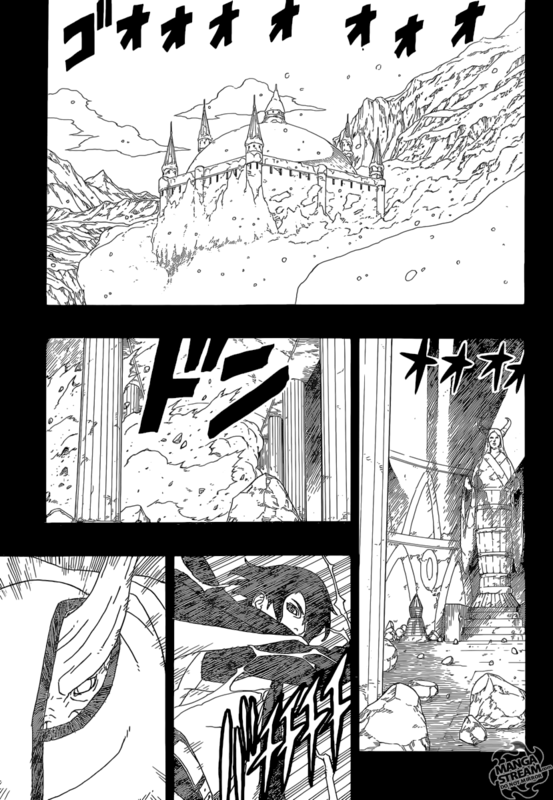 Ichigo destroys the top of the palace. 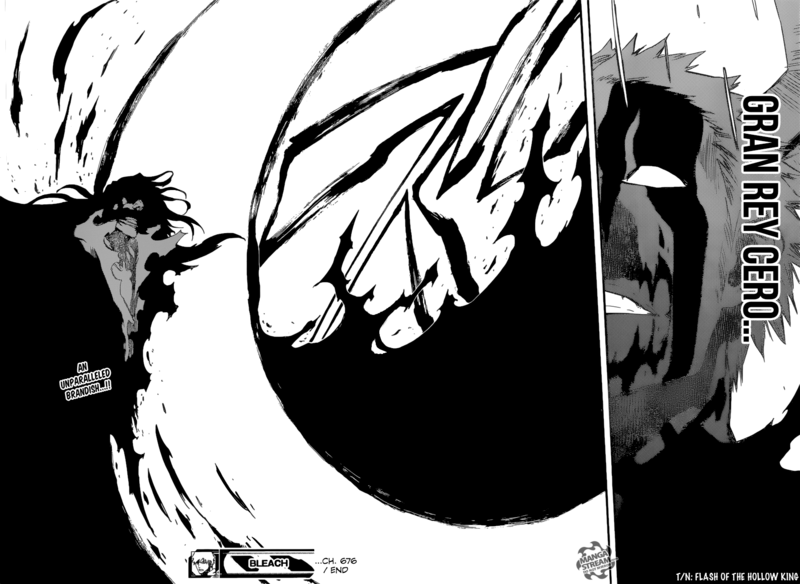 Yhwach call’s his power “magnificent.” He successfully block’s Ichigo’s attacks. 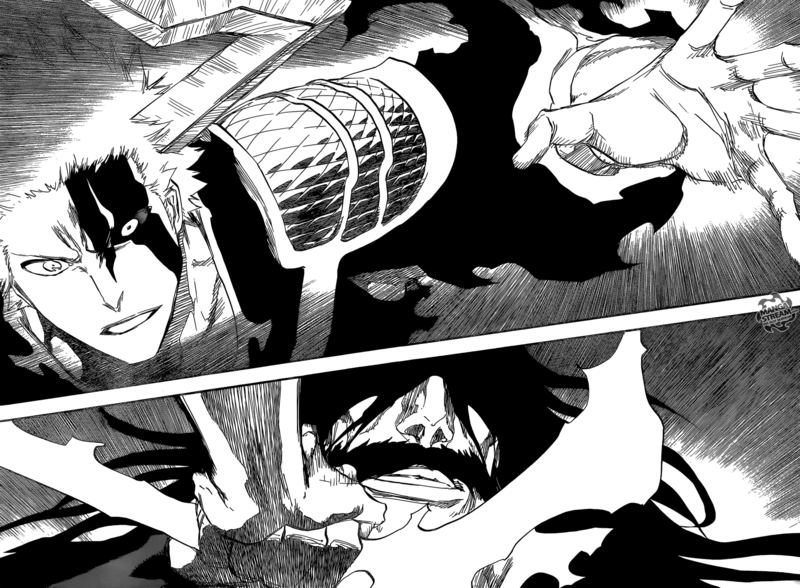 Ichigo responds by using Gran Rey Cero, cutting Yhwach. This chapter read quickly. 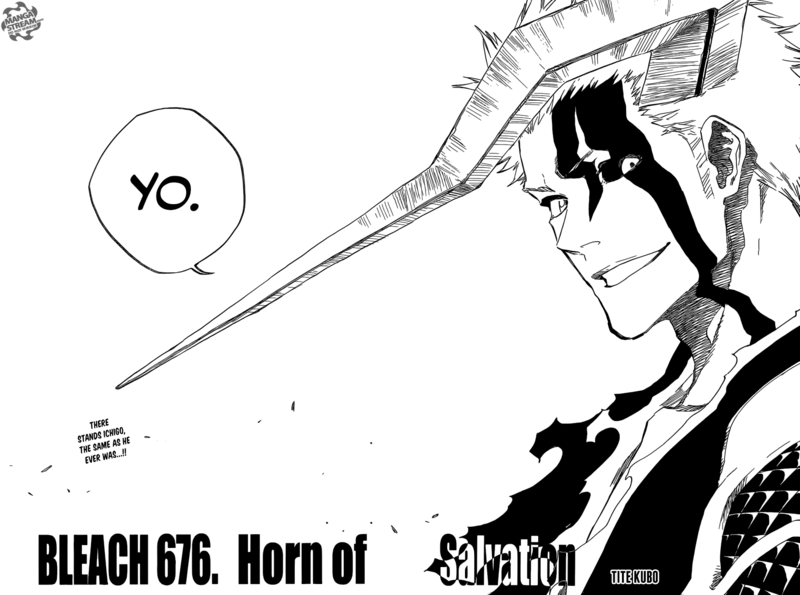 Visually, I don’t like Ichigo’s new form. I feel’s lazy and the one horn seems strange. His abilities however are cool and I will be interested in seeing more of them. This fight is far from over, but I like the way it started. 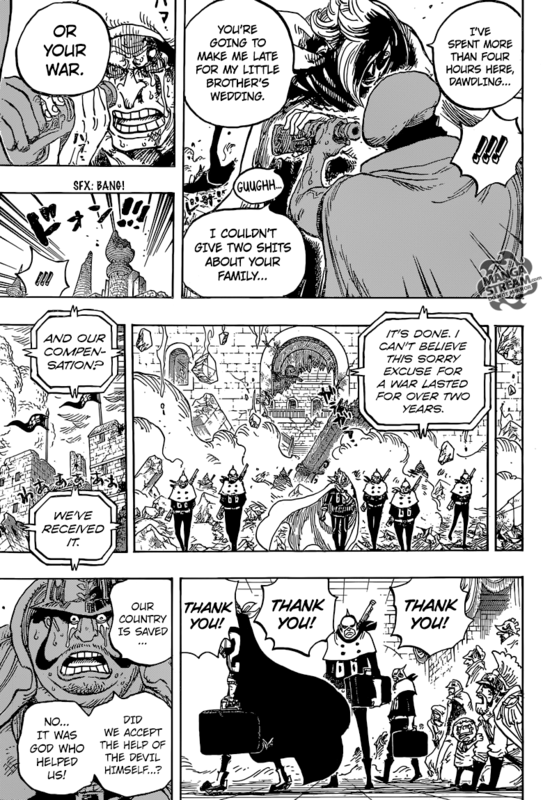 The Germa 66 are clearly ruthless. 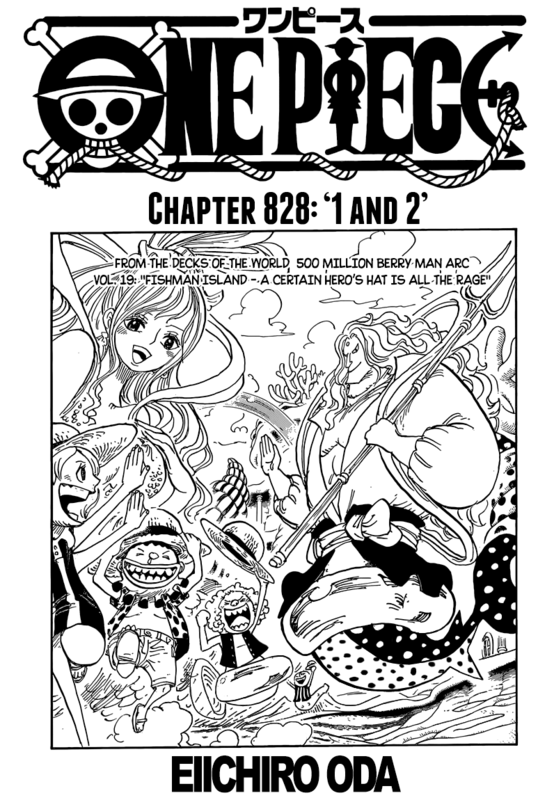 I think this will infuriate Luffy at some point. 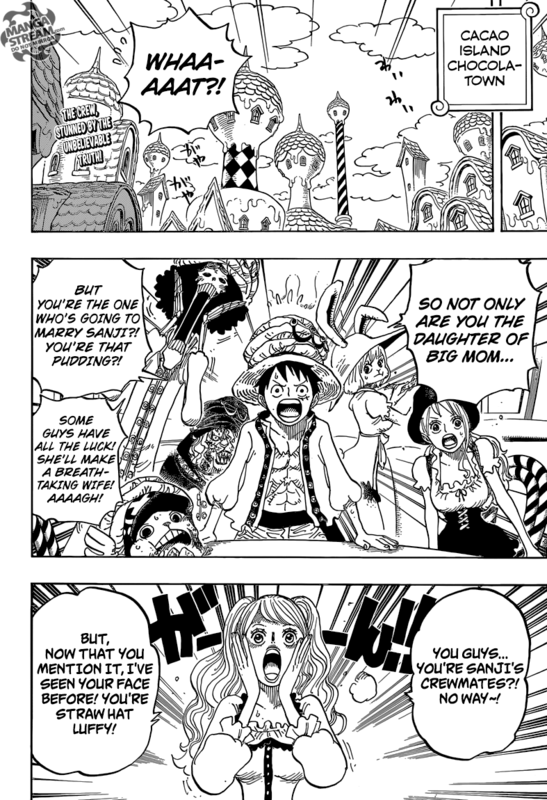 Big Mom family is interesting, and I hope we get to see some of her powers more in-depth. 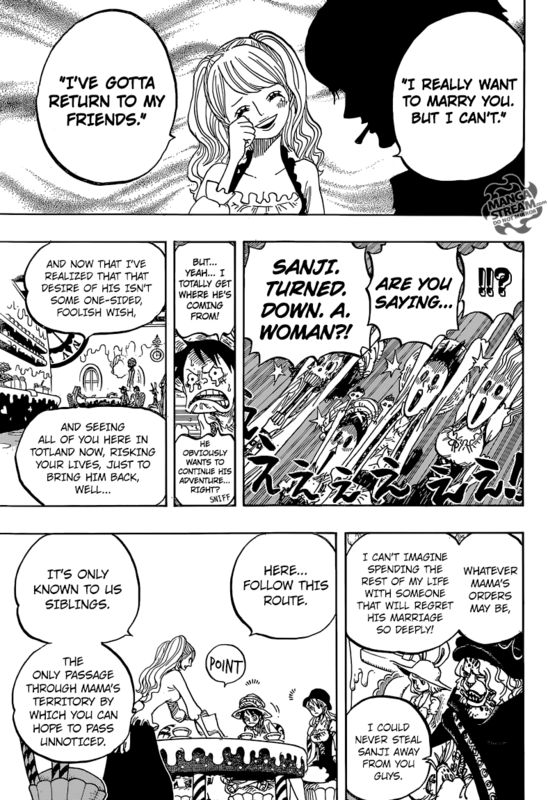 I think Purin may join the Strawhat’s as Sanji’s wife or she will die saving him. 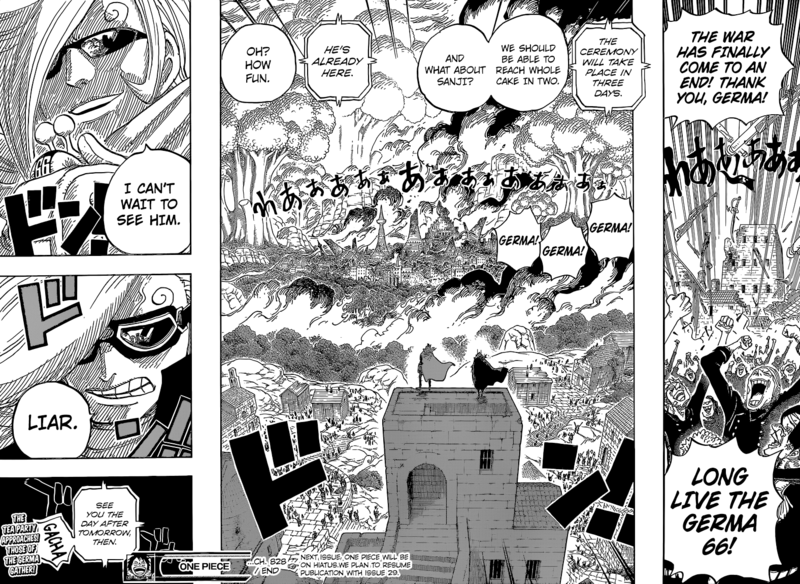 Regardless, Sanji will likely have to face-off against his siblings. I’d like to recommend a webtoon for you! You should definitely try Noblesse.. I have a feeling that you might like it!